Home › Marketing › How can pharma cross the Digital Chasm? Once upon a time, an HR Director in a large organisation was trying to place me in the pigeonholes of corporate life. Jolly as one is when the focus is “all about me”, I talked through the jobs I’d done. Lab researcher, programmer, analyst, product manager, customer service manager, training manager, marketing director, VP strategic marketing, global e-marketing director, global brand comms director. “What do you like most?” was the question she patiently asked, looking into my eyes, and, she hoped, no doubt, my inner self. “Change” I replied without thinking. Like you, I’ve been on the leadership programmes, the “solution-selling” and “customer-centric-marketing” and “marketing excellence” initiatives. But I’ve long been a student of human folly, and one thing has consistently struck me, through all the changes I’ve seen (test-tube chemistry to computerised micro-samples, punched cards – I kid you not! – to augmented reality, sneaker-net (carrying floppies across the office) to cyberspace, and so on) is the way human beings react to and embrace (or not) change. Geoffrey Moore had it fairly spot-on in his seminal work Crossing the Chasm (originally published 1991). In other words, from a small number of ‘innovators’ (the techies who play with the new stuff for its own sake) to a larger number of ‘early adopters’ (who see the possibilities of the new technology and are willing to put up with the fact that it is unfinished because they are visionaries) through to the ‘early majority’ – the mainstream early users – followed by the ‘late majority’ and ultimately the die-hard ‘laggards’. What was different about Moore’s hypothesis is that he said if the technology is ‘disruptive’ (i.e. completely unprecedented – not “faster horses” but “the motor car” – as per the famous supposed Henry Ford quote), then there is a very large gap between the early adopters and the early majority – the CHASM. The early adopters have these characteristics: they give credence to the innovators and listen to them; they can translate from tech innovation to business success; they are willing to “finish” the product with their own resources, recognising it is new and may require considerable development to be a commercial product; they understand it is unproven and will take the risk, they will invest and put themselves on the line because they believe in the new innovation. However, the early majority are totally different. They want a product that is complete, stable and supported; they expect it to have proven return on investment; they expect a good support infrastructure; they want to know the product is reliable and has good references, they will not risk their reputation on the new technology. Why should they? 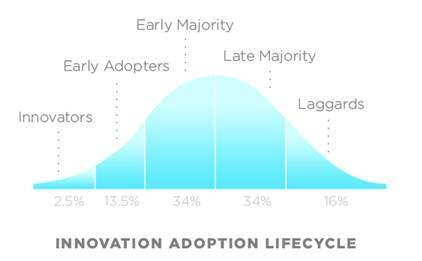 Therefore, the worst person to sell a new technology to the early majority is, in general…the early adopter. We had recruited client development partners, run focus groups and had an extensive beta test program, and were very confident that the new Windows product would (eventually) have all the capability of the DOS version and would be much easier to use. At about this time, the great ICI de-merger was happening and Zeneca Pharmaceuticals was being born, leaving ICI as a paints and agrochemicals business. True to expectation, ICI retained the DOS financial product and Zeneca, the new kids on the block, wanted the new-fangled Windows version. I remember working with them for months on the implementation. It was a very happy and productive collaboration. That was the day I fell right into Geoffrey’s Chasm. Now, almost 20 years later, I consider where we are with Digital Pharma. The innovative brand managers and eMarketers have run pilots and by gum, we’ve shown return on investment. Everyone KNOWS that customer-centric marketing, with digital as a core component, is the future, right? The problem is, the early adopters in our industry are not turned on by “training” or “embedding” or “standard operating procedures”. So the visionaries who were building websites 10 years ago are now off building apps…and still “websites” are not core to our brand communication plans – although in many cases they probably should be. A brand manager in any other industry would be reprimanded if their product website wasn’t number 1 in Google for the brand name in their country…but for pharma brands it is a rare thing when they are. Our industry culture doesn’t help. We reward “innovation” not “embedding”. A forward-thinking brand manager who does exciting new stuff that seems to work is quickly promoted to another, often regional or global role, leaving the innovative new practice to wither on the vine. Meanwhile our core business model is 50 years old and creaking at the seams. What we must have is the leadership will and the management skill to really embed a digital/multichannel customer engagement culture, backed up with everyday stuff like training, best-practice documents, standard operating procedures and day-to-day mentoring and coaching in new ways of doing business. The pharmaco that cracks this first, will be a winner. Will it be you?